"Mo' money, mo' money, mo' money!" 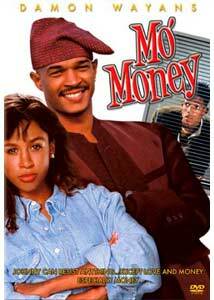 As Damon Wayans' first major starring role in a comedy, Mo' Money probably could have been a lot better. Not that it's terrible, but it seems to go in a lot of different directions, most of which lead away from the comedy. Starting out very strongly, Mo' Money tells the story of Johnny and Seymour Stewart (brothers Damon and Marlon Wayans), a pair of con men with street-smarts and plenty of ambition to make the big scam. The problem is, Johnny is tiring of playing the game, and he knows he could end up in prison if he keeps going on this route. He decides to give up fighting the 'establishment' and, with the help of his father's old police partner, Lt. Walsh (Joe Santos), gets himself a job at a credit card support center. Once there, however, his old, street scam experience kicks in and he discovers how easy it is to take returned credit cards with unrecorded numbers and use them to buy pretty much whatever he wants. So, Johnny and Seymour go on huge shopping sprees with their pseudo-stolen credit cards and find themselves living the high life. John even gets involved in a romance with co-worker Amber (Stacey Dash). While all this is going on, the film also tells a poorly inserted story of a series of mysterious murders going on around town. Strangely, some of the evidence comes back to the credit card company where John works. Eventually, John's fun comes to an end when the security chief discovers what he's up to. Since he's facing prison, the chief decides to use this to his advantage, and makes John involve himself in his mysterious criminal enterprises. From there, the film takes a strange turn that, to me, never quite made much sense. Mo' Money had all the makings of a good, solid comedy right from scene one with its concept of two scoundrels trying to get by in the heart of urban chaos. The needless crime mystery plot seems to just add an uncomfortable level where we see these characters in numerous situations where their lives are threatened and controlled by someone else. I understand why the script wants to make these guys into heroes by pitting them against baddies, but to me, it didn't work. Damon Wayans is an extremely capable actor and, at the very least, he handles the serious parts of the film well. He can be dramatically intense or loose and funny in an instant, which definitely adds strength to the film. In the end, I just felt that having two central characters, a romance angle, and a criminal mystery subplot was just too much to handle. It's a fun, lighthearted movie for awhile, in the earlier, better portions, but it becomes scattered and depressing later on. I would have liked to see more of John and Seymour's unusual antics go on for a much longer period of time; that would have been humorous enough to support a whole film. I guess the filmmakers were aiming for more, but only over-complicated their story. Image Transfer Review: I'm unable to officially confirm whether or not Mo' Money was filmed for the 1:33:1 aspect ratio, but I'm assuming the transfer on this disc is simply open-matte, originally intended to be cropped to 1:85:1 (also indicated by the infamous "reformatted for your TV" phrase on the case). In any case, the film is not widescreened, but I noticed nothing suggesting loss of image composition or awkward scenes. However, this also means no anamorphic enhancement, which may disappoint some people. While the disc is far from fantastic, it isn't too bad. It does exhibit some heavy grain and compression artifacts depending on the scene (the darker the worse, usually). There are no problems making the film too ugly to watch, but it isn't a definitive transfer. Audio Transfer Review: Dolby 2.0 Surround provides the soundtrack, and while there is no major action or activity to look for, the front soundstage is generally pleasing. Most of the strength goes into the musical score, but the other elements are handled well and there are no complaints. Extras Review: There is an original trailer for Mo' Money, but no other supplements or features. As a comedy, Mo' Money is decent, but lacks any serious punch for me. It might be a good rental if you're looking for a few laughs, but I can't say it's anything special.